Application Field:Cement,refactory material industry, etc. Ceramsite sand rotary kiln is widely applied to the calcining and production of ceramsite sand, kaolin, bauxite, dolomite, clay, silt, fly ash, city life garbage, alumina, magnesium oxide, zinc oxide, etc. 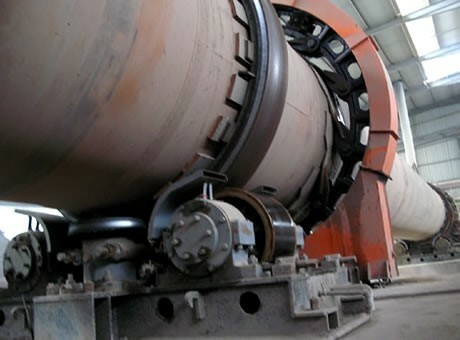 The ceramsite sand rotary kiln produced by Fote Machinery has many advantages such as simple structure, smooth operation, high thermal efficiency, good effect, low heat loss and high output. Ceramsite sand rotary kiln is also called rotary kiln for ceramsite sand, which is widely used for the calcining and production of ceramic sand, clay, silt, clay, fly ash, slag, shale, dolomite, kaolin, bauxite, refractory material, cement, limestone, iron ore, titanium powder, activated carbon, coke, powder, alumina, magnesium oxide, zinc oxide, special cement, etc. It is composed of the cylinder, bearing, gear wheel, kiln head and kiln end. The kiln body should have a certain inclination with the horizontal line, which is supported by the supporting wheel, and it is also equipped with a gear wheel. 3. Simple structure, smooth operation, high thermal efficiency, good effect, low heat loss, high output, long service life, etc. When the ore enters into the rotary kiln, it should be heated firstly, the ore and hot air flow will be in reverse movement, when the ore in the heating zone is heated to the reduction temperature, it will return to the reduction zone; after entering the cooling zone, the ore will meet the gas; when the gas is preheated, the ore will be discharged after cooling. Fote Machinery is a ceramsite sand rotary kiln manufacturer in China, and the ceramsite sand rotary kiln price of our company is the most reasonable among other manufacturers. Customers are welcomed to pay a visit to our company!